This is something new for us here at goodiegoodie. In honor of National Volunteer Week we thought we would expand our horizons. After all, that is sort of what international volunteering is all about. Staring this week, we're going to post about some organizations that give back through volunteering! Four years ago today, I embarked on what was to be a life changing trip. 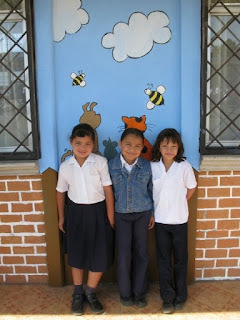 I spent a week in the Central Valley of Costa Rica volunteering at a school for extremely impoverished kids. I went alone and I can admit now that I was totally scared. One week later, I came back with some amazing friends and a completely new attitude and purpose in life. My trip and volunteer program was organized by the international volunteering organization Cross-Cultural Solutions. Cross-Cultural Solutions' mission is to operate volunteer programs around the world in partnership with sustainable community initiatives, bringing people together to work side-by-side while sharing perspectives and fostering cultural understanding. The CCS approach to volunteer work is effective because they defer to the needs and goals of the communities they serve and connect volunteers with the expertise of local leaders. These aren't a bunch of do-gooders rushing in to tell people how to live their lives - these are caring people helping to fulfill a community's needs. CCS is an international not-for-profit organization with no political or religious affiliations. They have volunteer placements in Africa, Asia, Eastern Europe, and Latin America that range in length from one week to twelve weeks. They have trips for students and teens, adults, individuals, families, seniors, and even people with disabilities. You have to pay for your volunteer program, but they provide everything from ground transportation, accommodations, all meals, volunteer placements including financial contributions to the participating programs, even some excursions. And if you're really concerned about the program expense, it's tax deductible. Be more than a typical tourist on your next vacation. 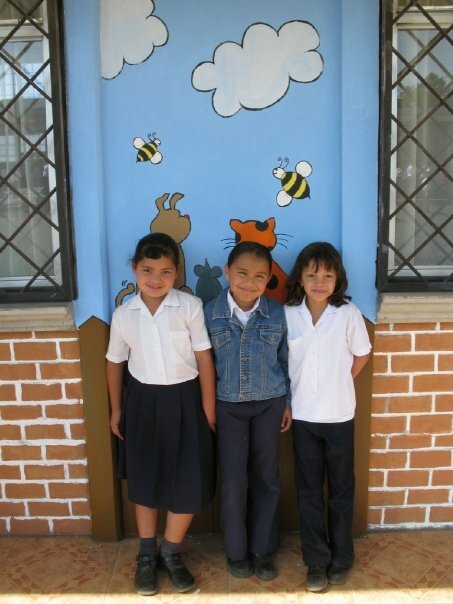 Visit somewhere amazing and make a difference at the same time! We want to tell you about a couple of awesome kids who are making a difference in the world. Meet Alex and Hannah, eight-year old twins from Cincinnati. They love to read, and when they learned that an entire school of kids had no books, they decided to do something about it. With the help of their mother, Alex and Hannah started Adopt A Book, a 501(c)(3) that provides new and gently used books to children. 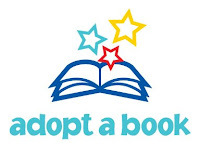 Adopt A Book collects new and gently used books and donates them to organizations and charities that support disadvantaged kids in the Cincinnati area. These little do-gooders have already collected thousands of books and donated to several organizations and schools since December 2011. If you'd like to donate some books to this great little organization, send them an email or contact them via Facebook to make arrangements. And by the way, we looove stories about little goodiegoodies. If you know about kids that are doing cool things and working to make the world a better place, be sure to let us know! Good morning! Have you had your coffee yet? We have...and it's good. And it's good for the world, too! In fact, we love this coffee so much, we get a monthly shipment of Kicking Horse Coffee. Kicking Horse's mission is to stimulate the planet with the ultimate wake-up call. That'll come in handy on a Monday morning. All Kicking Horse coffee is 100% certified fair trade and 100% certified organic. Organic coffee is better for the environment, better for everyone’s health, and provides a better standard of living for the farmer. Kicking Horse is committed to sustainability, and they strive to make positive social and environmental impacts on the planet. They're also heavily involved in their community, both locally and throughout British Columbia. They support nature groups, local food banks, festivals, and a bunch of other charitable and sports related events in their community. Now, a word about the coffee. My favorite so far is the Three Sisters blend - medium, warm, and nutty. Deeelicious. They have 16 other different blends of 100% fair trade organic coffee. Shop online and use their handy charts to choose your favorite flavor from Light (Bold) to Dark (Extreme Bold) and choose from different taste profiles based on aroma, acidity, body, and flavour. Kicking Horse also sells tea, chocolate, and mugs & stuff. You can shop for everything on their website, and some products are also available in stores and at online retailers like Amazon. 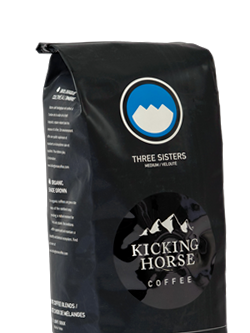 Kicking Horse Coffee is a great way to kick off your week and do something good for the world!